The fact that home growth has slowed in 70% of the United States’ 200 largest housing markets has economists debating whether the housing slowdown is the canary in the coal mine, warning of economic woes to come. But let’s all take a deep breath and one giant step back: Not every market is slowing down. 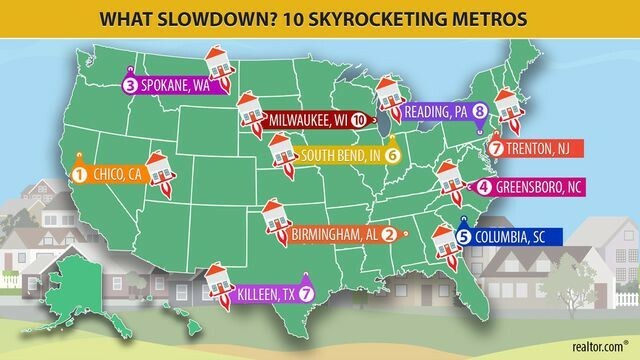 In fact, realtor.com® found 10 metros where home prices are actually shooting up. Welcome to the nation’s strongest housing markets—places that so far have eluded the shifting tides, with double-digit annual price growth. So why are some cities skyrocketing, while the rest of the country appears to have been clobbered by a double-whammy of rising mortgage rates and home prices that have risen too darn high? Depends on where you look. Places ravaged by natural disasters are seeing prices climb, as folks compete for a limited number of available properties. Those fleeing more expensive cities are substantially driving up prices in smaller and cheaper cities nearby. Some markets smacked hard by the financial collapse a decade ago are still recovering, meaning that they still have room for prices to move up. And other cities are simply seeing a torrent of new residents flowing in. “Even with the deceleration in home price increases … we are still seeing strong home buying in smaller metros that have good affordability and solid job growth,” says Frank Nothaft, the chief economist at Corelogic, a real estate data firm. To find the top housing markets unaffected by the national housing slowdown, we pulled December realtor.com listing data for the 200 largest metropolitan areas. * We eliminated those with year-over-year price growth that was lower than it was a year earlier, then ranked the rest on price and price-per-square-foot increases, as well as changes in inventory, days on market, and percentage of homes seeing price bumps. So which markets are bucking the big slowdown? Let’s check out the four trends continuing to push up home prices. Kyle Smith won’t soon forget the orange sky outside the window of his Paradise, CA, home. On Nov. 8, the 31-year-old youth pastor found himself frantically driving his wife and 2-year-old out of the evacuated town while smoke poured into their vehicle and midday skies turned black. Camp Fire would go on to become the deadliest wildfire in California history, claiming at least 85 lives and burning down 18,000 homes and buildings. The aftermath of the wildfire has pushed Chico, CA, the metro that includes Paradise, into the No. 1 spot on our ranking. Home prices in the city, about a 90-minute drive north of Sacramento, have climbed 14.7% over the past 12 months, to a median $330,100. In the days that followed the fire, many newly homeless families poured into the city of Chico looking for hotels and apartments, quickly buying up the handful of available homes. Chico, which had a tight real estate market before the fire, soon began experiencing bidding wars and surging home prices. In the short term, prices are up, but over time, the devastation might lead some to move out of the area rather than rebuilding. In the months since the fire, Smith has bounced around, staying in family members’ spare bedrooms in Chico and living in a recreational vehicle (RV) in a relative’s driveway. Just this month, he finally found an apartment, but he’s not sure if he’ll stay. The one-story home he bought for $160,000 in 2014 would now cost more than $300,000 to rebuild, given that developers’ prices are surging to meet the demand. Smith is now weighing rebuilding against moving out of state so that he can buy something more affordable—and worry less about keeping his family safe. When home prices soar far out of the reach of locals, residents have a few options: They can start renting, they can bail entirely to another part of the country—or they can move to more affordable, smaller cities that are relatively close. The latter option is becoming more and more popular, as people seek out places where they can still afford to become homeowners. Just look at Seattle. Homes in the metro cost a median $550,000—a steep climb, considering that median household income there is $82,133. That’s prompted many of the folks who don’t have those high-paying Amazon or Microsoft jobs to look at Spokane, WA, a four-hour drive inland. No, that’s not exactly a commutable distance to the Emerald City. But high demand is still driving up prices there—with the median home price up 15.4% in the last year, to $299,100. 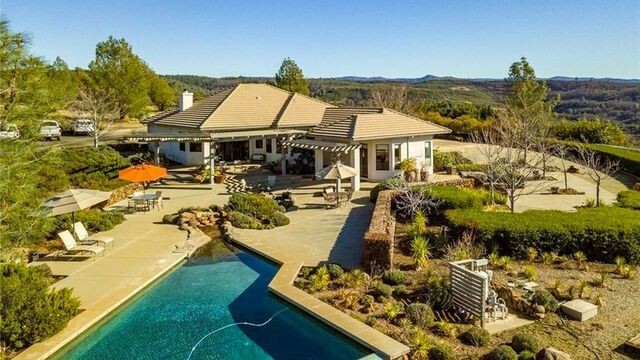 “Around half of my buyers are from out of town,” says Marianne Bornhoft, a local broker at Windermere Real Estate, and it’s creating a frenzy. 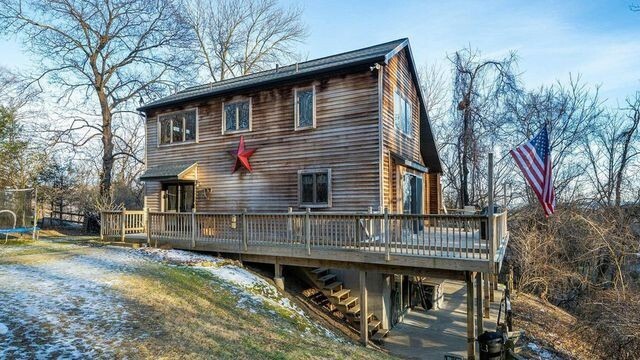 Earlier this month, she listed a home on a Wednesday, and by Saturday, it had attracted eight offers at or above listing price. Most Spokane newcomers are coming either from Seattle or Portland, OR. 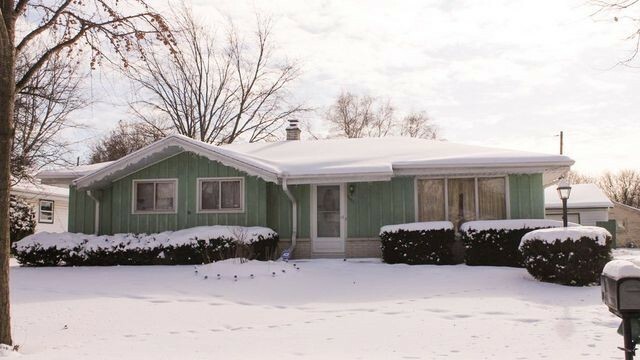 They’re buying up four-bedroom Craftsman-style homes for under $275,000. 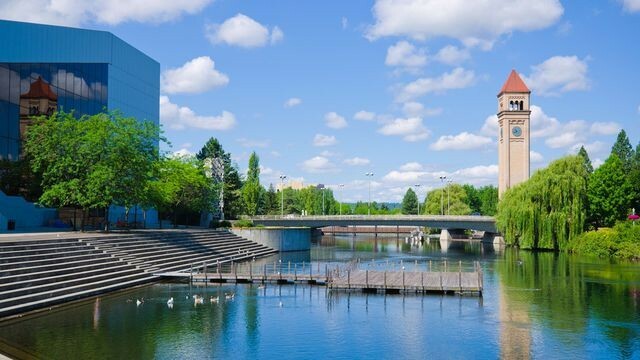 They dig the endless opportunities for outdoor activities along the Spokane River: realtor.com named Spokane one of the country’s top affordable outdoorsy cities last year. A similar phenomenon is happening in Greensboro, NC, where the median list price has climbed 14.6% over the past year, to $220,000. Home values are getting driven up there by an influx of folks moving from the heart of the Research Triangle in Raleigh and Durham, each around an hour away, where median home prices are $340,000 and $351,000, respectively. The triangle is home to several top universities, including Duke, as well as a slew of high-tech companies and startups. The housing slowdown is most pronounced in America’s most expensive cities, like San Francisco, where home prices have raced up for years. On the flip side, many of the places where home prices are still growing now are smaller metropolises where the economy took longer to rebound. A prime example is South Bend, IN. This Rust Belt city has had some rough patches as plants closed and locals left. Slowly but surely, the city has rebounded in recent years. With the help of Notre Dame University, which is located in the area, the city has built a small but dynamic tech sector and start-up scene. Elkhart, IN, just 30 minutes out of town, has seen its RV manufacturing business boom and is now paying top dollar to find talent. The rebound in South Bend has been so profound that its current mayor, Pete Buttigieg, announced last week he was pursuing the 2020 Democratic presidential nomination. In response to the region’s growth, home prices jumped 15.4% last year to a median $150,000. “We’re seeing multiple offers if a home is priced right. The shortage of inventory is the driving factor,” says Beau Dunfee, managing broker at Weichert Realtors, Jim Dunfee & Associates in South Bend. He hasn’t seen signs of the housing slump that agents in Seattle and New York are experiencing. “The Midwest is usually a step behind the West and East Coast.” In this case that’s a good thing—for sellers, anyway. The economy of Milwaukee, WI, has also continued to grow. It boasts a total of 13 Fortune 1000 companies, including Harley-Davidson and Northwestern Mutual. Homes here sell quickly. In October, realtor.com ranked Milwaukee as one of the markets with the fastest-shrinking inventory. Over a three-year period, inventory there has dropped 37.3%, a loss of 5 million square feet. So it shouldn’t be a surprise that median home prices are up 14%, to $244,640. Inventory in Milwaukee is shrinking, and not just because of the cold. “It looks like 2019 will be just as strong as the previous year,” says local agent Beth Jaworski. There’s a similar story unfolding in booming real estate markets in Birmingham, AL (10.8% price growth); state capital Trenton, NJ (16%); and Reading, PA (14.2%). They all got hit hard by the downturn and took some time to recover. But now they’re looking good, with low unemployment rates and relatively affordable (if fast-growing) home prices. When droves of people move into a new community at the same time, they compete against local buyers and drive real estate prices up. And up. This is why Killeen, TX, made our list. As the home of Fort Hood, the military post employs around 54,000 civilians and soldiers and attracts contractors like General Dynamics, an aerospace firm with a presence in the region. In 2017, Killeen’s population grew 1.6%, double the national growth rate of 0.8%. It isn’t slowing down. From 2015 to 2030, the metro area’s population is expected to grow 23%, according to the Texas Water Development Board. In response, median home prices in Killeen have jumped 13.9% to $205,000. But those are still bargain rates compared to larger Texas cities like Austin, TX, just over an hour to the north. Why pay a median $349,100 home price in the Austin metro when you could get a three-bedroom ranch home for under $150,000 in Killeen, which is within commuting distance? “People are being pushed out of Austin,” says Andrea Curtis, broker/owner of United Country Premier Properties in Killeen. 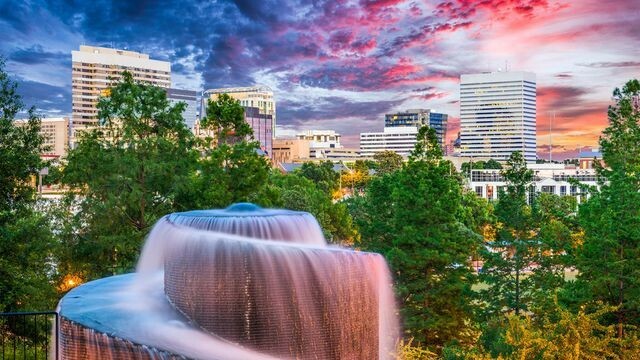 Columbia, SC, is best-known as the state’s capital and home of the University of South Carolina. But a lot of the commotion these days is about all the moving trucks: Population growth in the Columbia metro in 2017 was 31% higher than the national rate. Much of this population growth is tied to the surging population of South Carolina and the rest of the South. Around this time of year, those mild winters in the Carolinas really start to sound nice—as do the lower taxes and costs of living, particularly to young families and retirees. This is helping to push home prices higher. The median price in Columbia climbed 16.5% over the past 12 months, to $232,00. * A metropolitan statistical area is a designation that includes the urban core of a city and the surrounding smaller towns and cities. We limited our rankings to just one metro per state to ensure some geographic diversity. The post What Slowdown? The 10 Markets Where Home Prices Are Unstoppable appeared first on Real Estate News & Insights | realtor.com®.